On January 19th, Wizards of the Coast will release the Rivals of Ixalan expansion set, completing the two-set Ixalan block (which will be the last two-set block). The upcoming Rivals of Ixalan continues the story of Ixalan, where four feuding tribes of Magic the Gathering: Pirates, Vampires, Merfolk, and Dinosaurs (making their tribal debut in this block) find themselves at the legendary Golden City of Orazca, and all out war will decide which faction will claim the legendary artifact, the Immortal Sun. At the same time, the planeswalkers Jace Beleren and Vraska (sent by Nicol Bolas) arrive at the Golden City on their own, where a fateful encounter with the legendary sphinx Azor will unlock Jace’s memories of Ravnica and beyond. Even the extra-planar minotaur, Angrath, finds himself in the crossfire. Transform returns, morphing enchantments into powerful lands with a unique, map-like card frame. 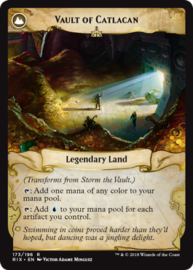 This one transforms from Storm the Vault into a new Tolarian Academy. Photo courtesy of WOTC. Mechanically, Rivals of Ixalan makes a gentle transition from the first set’s exploration and feud-based flavor for the deadly struggle over the Immortal Sun. The Explore mechanic returns, allowing a creature to either receive a +1/+1 counter or draw a land from the top of the player’s deck. The Golden City of Orazca has already been found at this point, however, meaning only three green cards have Explore, and none in the other colors except for on one black creature, Tomb Robber. Raid and treasure tokens, however, make a stronger return, often appearing on blue, black, and red cards, especially among those geared toward Pirates. Being battle-oriented, Raid is a fitting inclusion for the tribal warfare of Rivals of Ixalan. This set introduces Ascend, a new mechanic based on Orazca and its boundless treasures and primal blessings. Appearing on creatures, enchantments, and even instants and sorceries, Ascend gives bonuses if the controlling player controls ten or more permanents. On instants and sorceries, Ascend checks the permanent count at the time of resolving, whether on a spell or a permanent’s triggered or activated ability. Ascend grants many different bonuses based on the card’s flavor and color, such as bonus card drawing on Secrets of the Golden City, or devastating effects such as the Ascend effect on the instant Vona’s Hunger. Without Ascend, this card forces each opponent to sacrifice a creature. With Ascend, instead each opponent sacrifices half of the creatures he or she controls, rounded up. A deck full of Ascend cards can find itself profiting endlessly when the player has the token marking the ten-permanent threshold. The four tribes of the Ixalan set shift away from exploration and raids to tightly-knit groups fighting over the Immortal Sun. In Rivals of Ixalan, the tribal component is expanded, including “lord” effects of grating +1/+1 to all creatures of a specified type, as well as cards that become more potent or cheaper to cast in a certain tribe. For example, Silvergill Adept (a reprint from Lorwyn) is an undercosted 2/1 Merfolk that costs another three generic mana unless its caster reveals a Merfolk card in his or her hand. Cherished Hatchling, a cheap green Dinosaur, grants Flash and the “fight” effect to Dinosaurs you cast on the turn that it died. Many more creatures, instants, and sorceries also cash in on tribal support to power up a deck or undermine an opponent’s board presence. 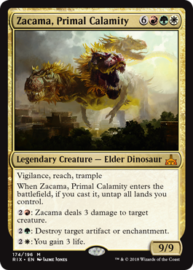 Like Gishath in the Ixalan set before it, Zacama, Primal Calamity can be the capstone of a powerful Dinosaur deck in Commander, complete with three devastating abilities. Photo courtesy of WOTC. A new cycle appears in Rivals of Ixalan: five Elder Dinosaurs, one for each color, capped by a second red-green-white legendary Dinosaur. Each of these Dinosaurs is a large, expensive beater with devastating effects fitting their colors. The white Dinosaur in the cycle, Zetalpa, Primal Dawn, is a 4/8 flier with many combat-oriented keyword, while the red one, Etali, Primal Storm, is a huge 6/6 that can cast spells for free from the top of each opponent’s libraries whenever it attacks. These Dinosaurs will probably need a lot of mana ramp and tribal support in Limited and Standard, but may find a comfortable home in Commander, whether as a deck’s Commander or in the 99-card deck itself.